Unique handmade fabrics paired together in a perfect purse! 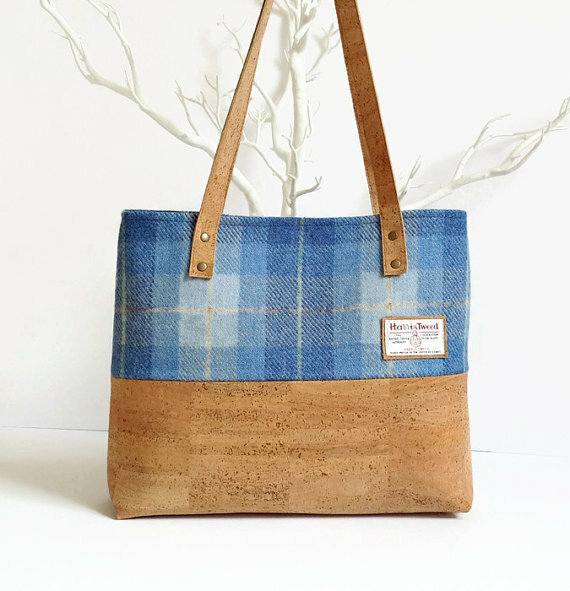 This over-the-shoulder Harris Tweed and cork bag is a one-of-a-kind purse! The beautiful combination of wool and cork is fashion forward and forms a brilliant color scheme. Plus it’s a great bag to carry everything you need. 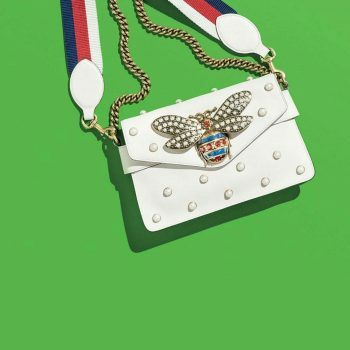 Nobody likes boring…and this bag is anything but boring. Not your typical leather, or even faux leather, but a unique mix of textiles that you won’t see anywhere. 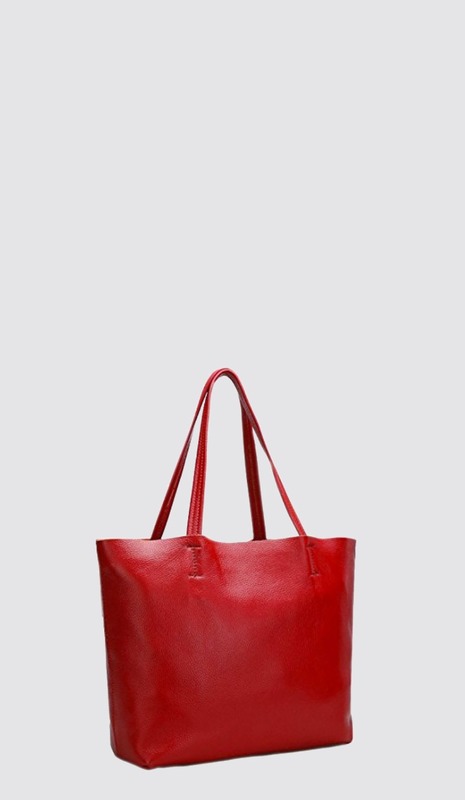 A supple cork, imported from Portugal, lines the bottom of the bag and the shoulder straps. 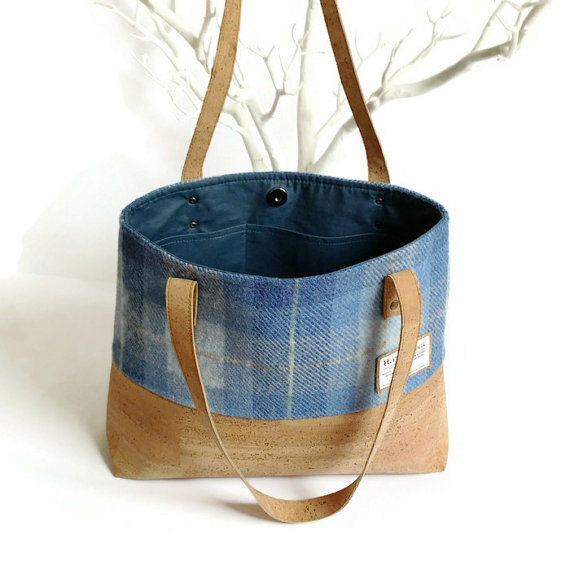 The top of the bag is finished off with a rustic Harris Tweed wool in a tartan blue color scheme that comes straight from Scotland. This bag is a piece of perfection worldwide! Beautiful checkered blue complimented by the neutral cork! Harris Tweed is an exclusive wool that is dyed, spun and handwoven from the Outer Hebrides islands off of Scotland. Impress your friends with that kernel of knowledge! It is a durable yet soft cloth. And the blue plaid pattern is effortlessly stylish. 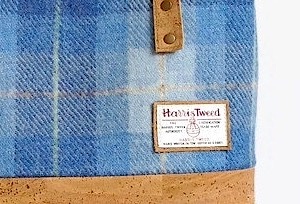 There is a Harris Tweed label on the front of the bag, authenticating its genuine Scottish heritage. Authentic Harris Tweed handwoven in Scotland! The cork lines the bottom of the bag because of its own durability. It is water-resistant and wear resistant. The cork comes from the evergreen cork trees in Portugal and definitely adds some eco-friendly luxury, and enhances the rustic look brought about by the blue wool. 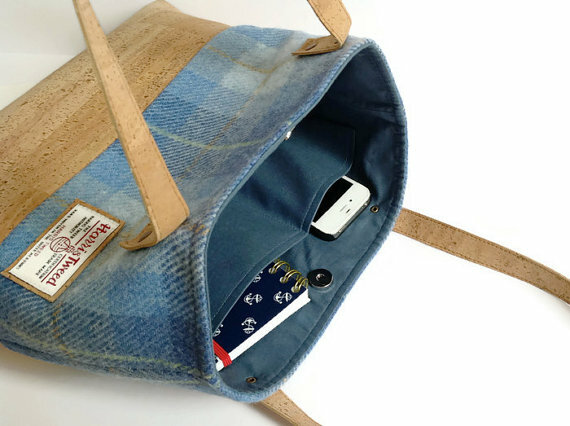 The inside of the bag is lined with a complimentary blue cotton fabric. It features two small pockets inside that can conveniently hold your phone or keys, and keep your small essentials separate. And you can easily snap the bag closed with a small magnetic snap on the inside. Excellent construction inside and out! 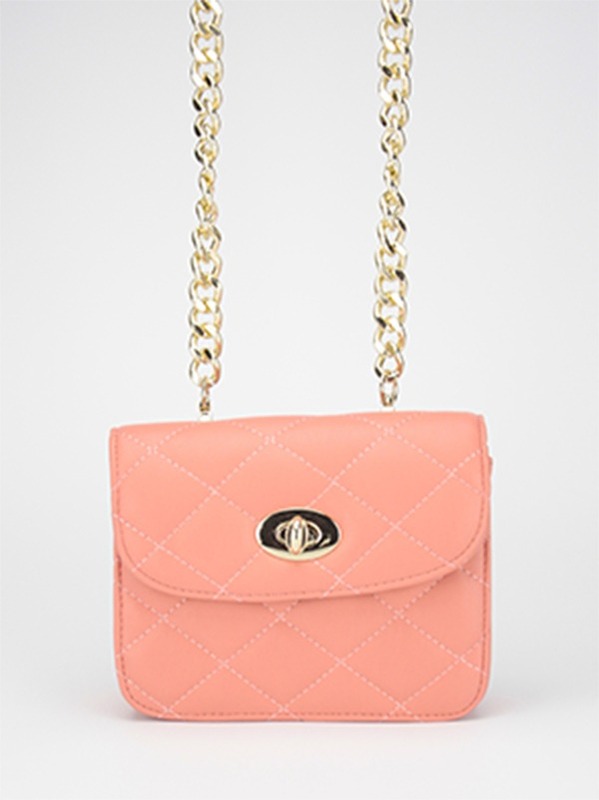 Not only is this bag in a league of its own in terms of design, but it is also a perfect size shoulder bag. The cork straps are 21.5 inches long, to fit perfectly under your arm. And the purse itself is 12.5 inches tall and 15.5 inches wide. 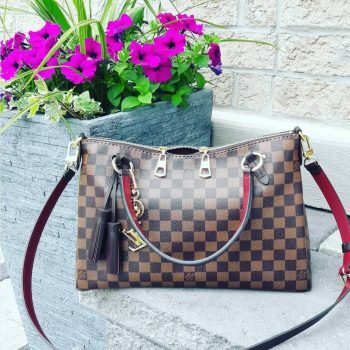 For those ladies who like to bring everything but the kitchen sink, this bag is the one. You can easily fit your wallet, phone, keys, make-up, iPad and book just to start. It’s an ideal size for everyday use! Dare to be different with a combination of wool and cork! 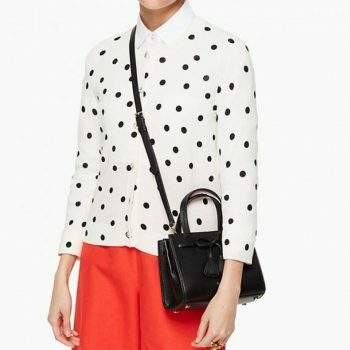 Whether you need a new handbag to carry into the office or classroom, or want a super modern and exclusive look that will make all your girlfriend’s jealous, this bag cannot be passed up. It really is a one-of-a-kind and will add an excellent charm to any ensemble. 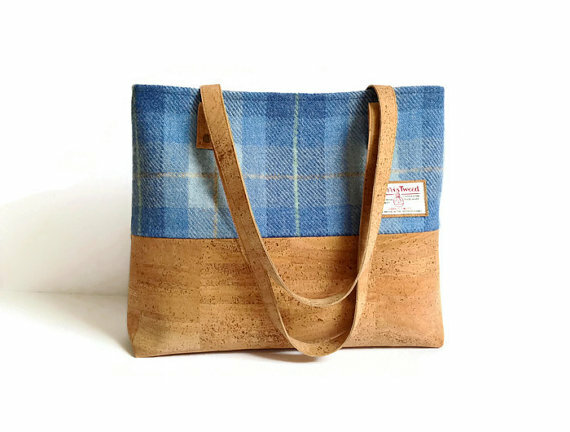 For more Harris Tweed and cork looks, check out My Cotton House!